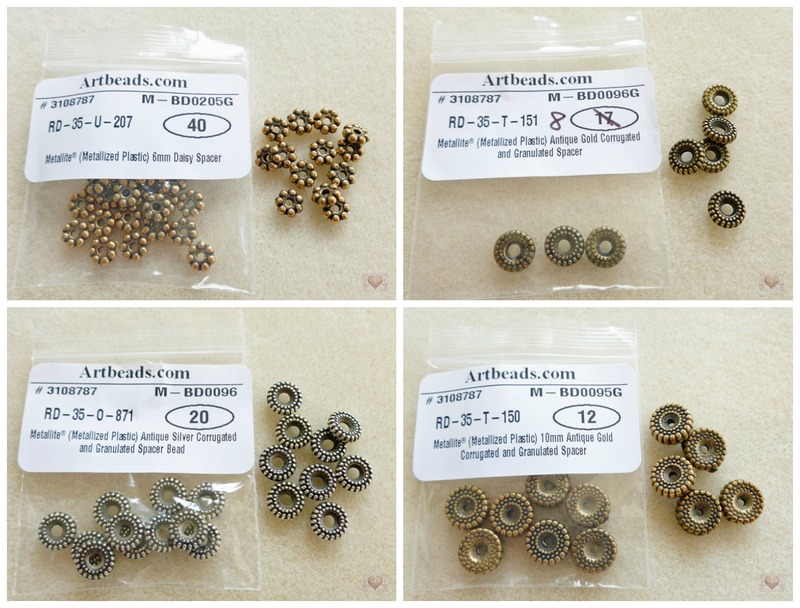 Today I'll make a review of my latest purchase at Artbeads.com, my favorite online store. 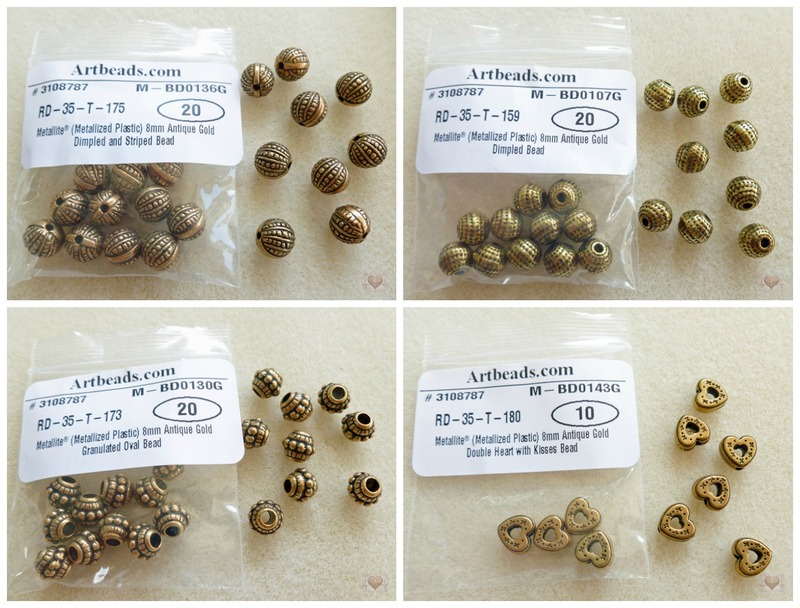 Artbeads have a great variety of materials for making jewelry and their prices are very reasonable. I'm often checking the prices of beads in different stores and it's common I find the lower price of some beads I use at this store. They also are offering deals constantly and at each purchase you'll receive a coupon with a discount to your next order. Sometimes you can even use this coupon in products already on sale! They ship worldwide. The only problem is - I checked on their website and I saw that they have only two options for international shipping: Priority Mail and Priority FedEx, which are more expensive than the Standard International option. But those living in USA will get free shipping for orders of $10.00 or more. As you can see, the order comes in an envelope that is internally coated with a bubble plastic layer to protect the products inside of it. The materials are inside of zip-lock bags, wrapped in these cute purple paper. Along with the materials was my invoice, a card with a code of a 10% discount for my next order, and a free tutorial - the "Triple Crown" Bracelet. When I made this purchase, I used a coupon of extra 50% of the clearance products that I received by email. 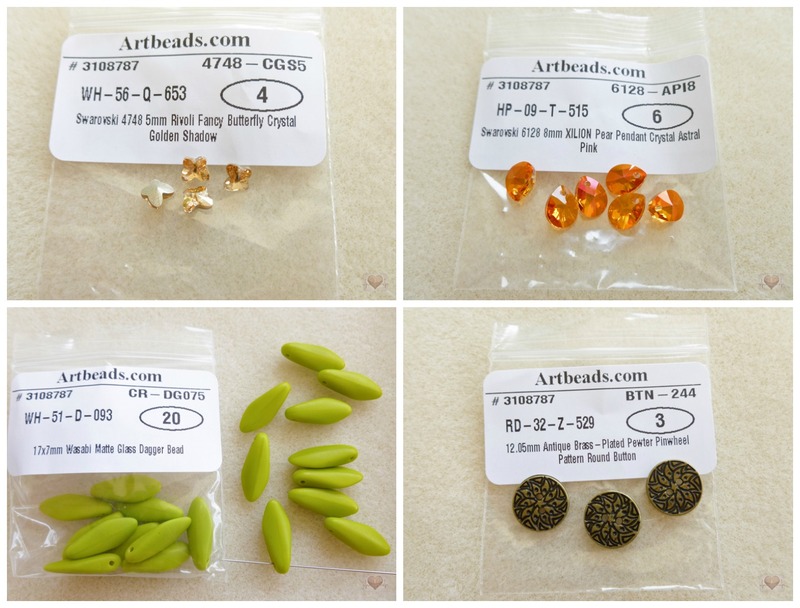 So I took the opportunity to buy some different kinds of beads I had never used before. A curious product I bought are the metalized plastic beads. I had never heard of them. They are made of plastic but look like metal beads. In other words: they're lightweight and they'll never tarnish! Hahaha I love these beads! I can't wait to use them on my next projects. In the picture below you'll see the little gecko clasps and some bails. A bail is used to attach a pendant to a chain, cord or ribbon, to create a necklace. I bought these bails because I had no one at home and they were very cheap with the discount. 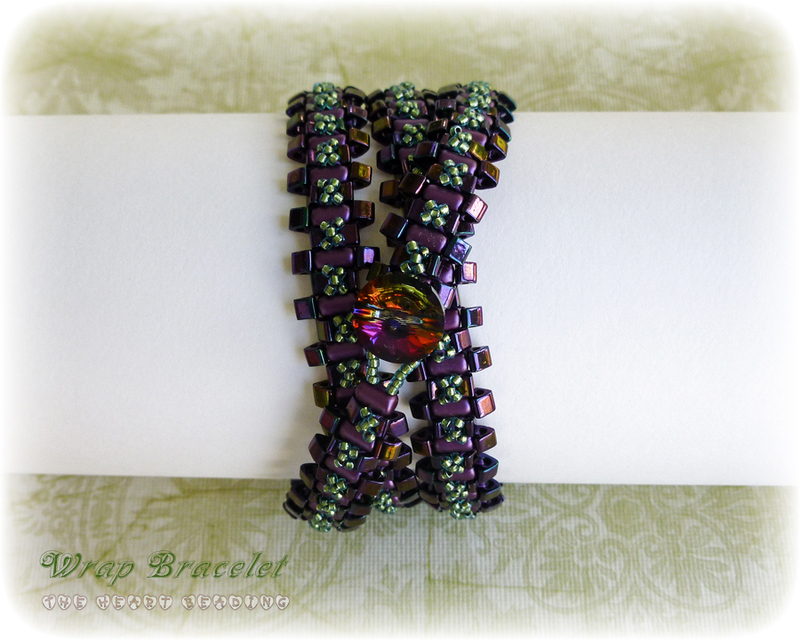 I usually create my bails with seed beads or I use thick jump rings to attach the pendants. I also bought some Czech bell flowers. They're beautiful, but I have no idea what I'll do with them. Any sugestions? 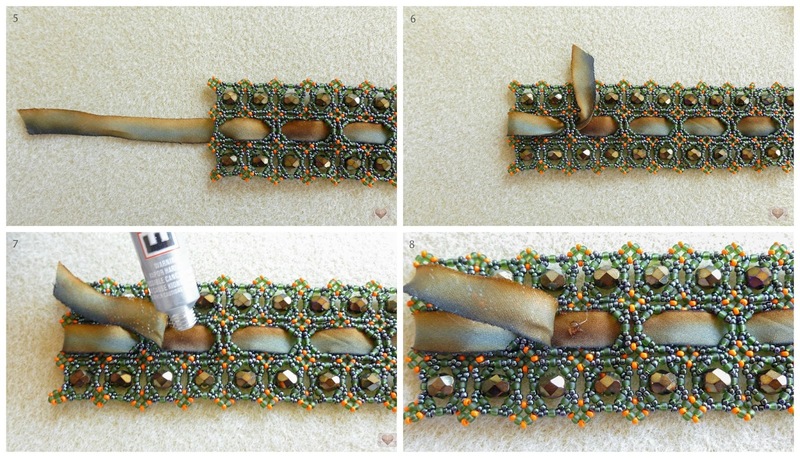 Next picture: some Czech glass drop beads in different shapes - briolettes, leafs and spades. These beads are very beautiful, I'm in love with all of them. 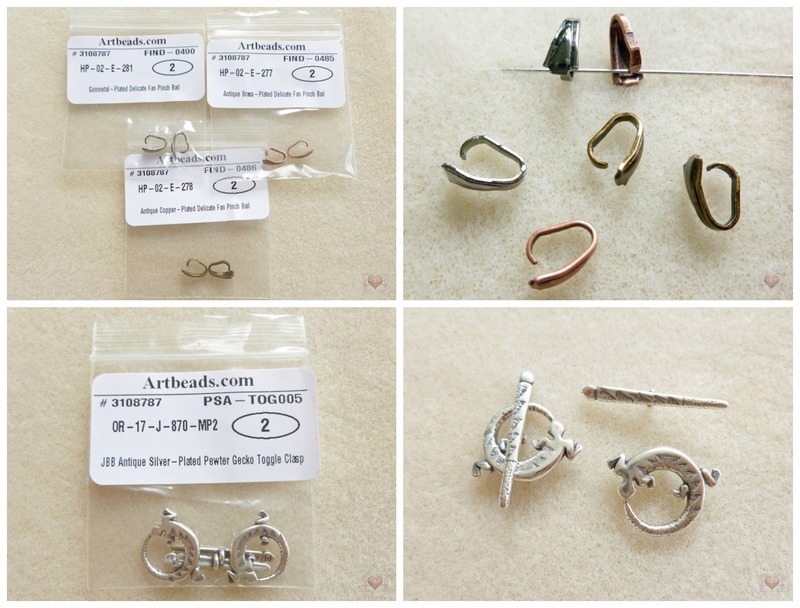 I will make earrings with the last one (the spades). The other ones I think I'll use in a necklace. 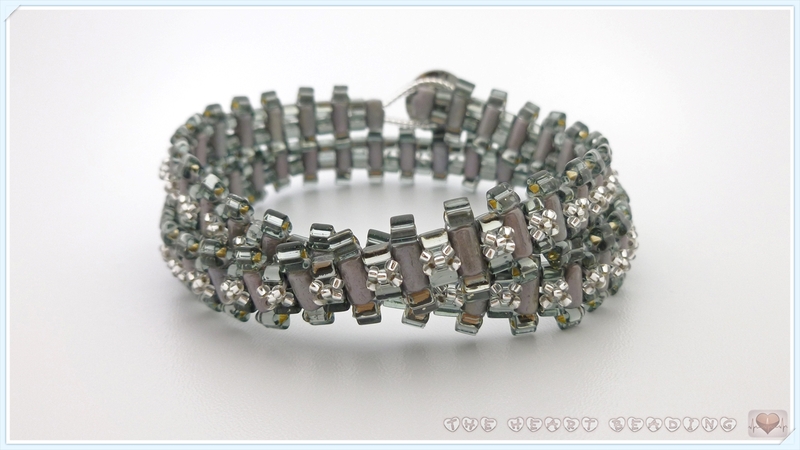 Next picture: Czech glass rondelles 9x6mm and Czech barrel beads. The first time I saw the rondelles I thought they were inconsistent in size. But I measured them and discovered that they all have the same size. The barrels measure 8x5mm. Now you'll see in the next picture my favorite beads of this purchase: the Czech oval beads. The color is so beautiful! I can't stop to think that I should have bought more of them! They measure 11x16mm approximately. 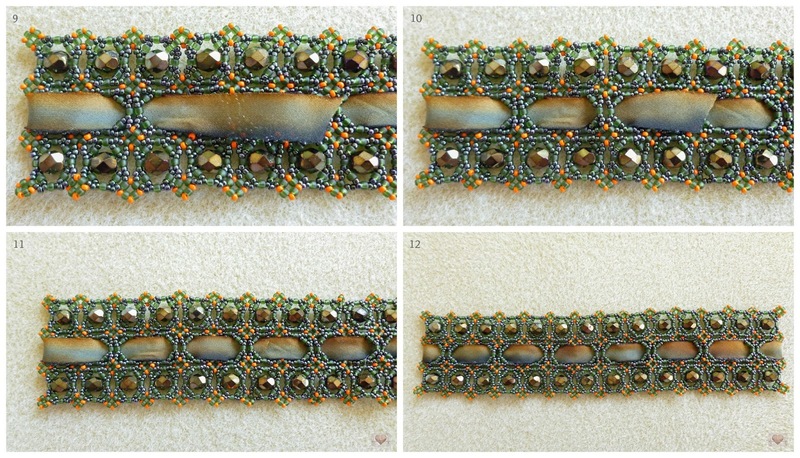 The Czech rectangular beads are made of glass, but they look like metal. They're really nice. I'm thinking of creating a rustic bracelet with them. 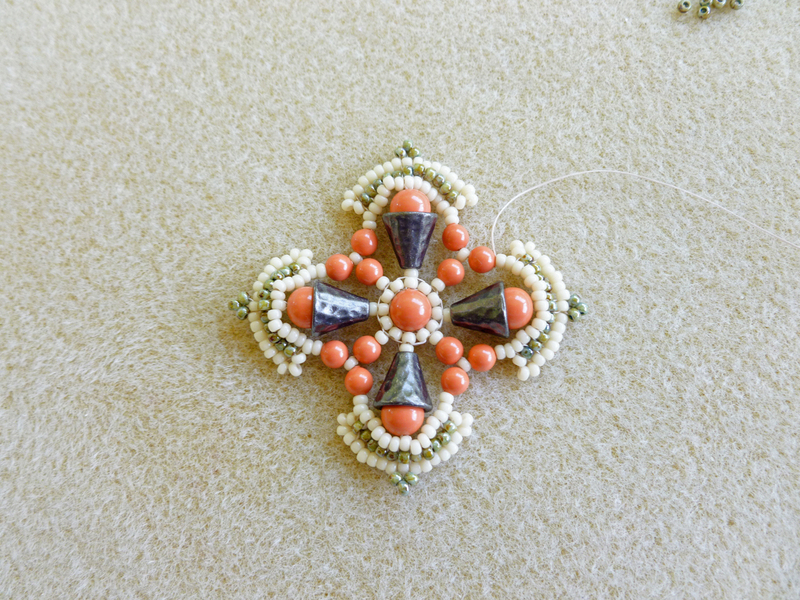 The last ones are 12mm Czech coin beads in a very nice color. 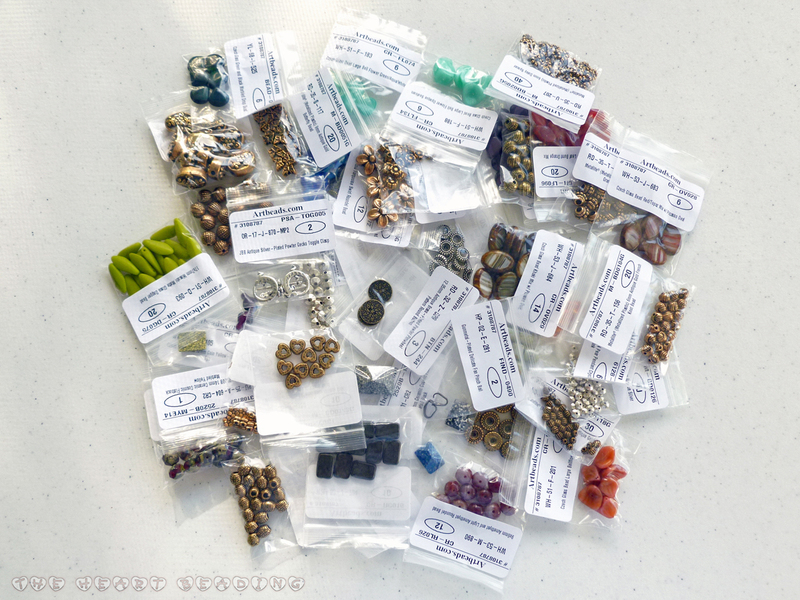 And the last items of my purchase: buttons that I'm planning to use as clasps, dagger beads, Swarovski pear pendants and Swarovski rivoli butterfly that I bought because I didn't pay attention to the description. 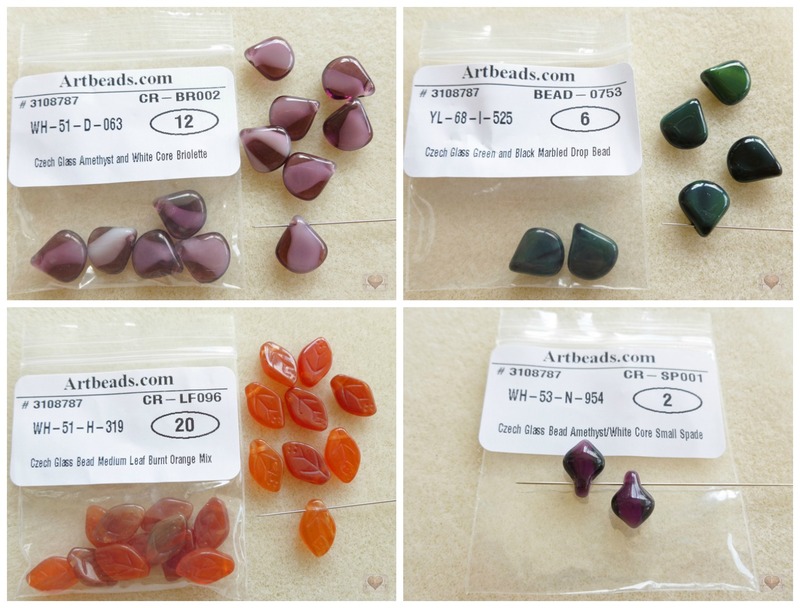 I thought they were beads but they are actually cabochons with no holes. Recently I discovered that some rullas release a red/brown ink color through their holes. It can be a big mess because it'll paint your fingers, beads, thread, and beading mat! It happens with some specific colors. Two that I bought and had this problem: "aquamarine travertine dark" (that I used to make one of the wrap bracelets) and "opaque picasso white". I tried to clean them with warm water and soap, but it didn't work. The only way I found to clean them was passing a cheap thread through their both holes several times. In the picture bellow you can see how my white Nymo thread got after passing it through the rullas. After that I passed a new thread through them to make sure the ink was gone. The second thread got a light red color after the process. At the end I cleaned the outside of the rullas with a paper towel. And they are finally ready to use! I cannot say which colors have this problem and which ones haven't, so I recommend you be careful when using the rulla beads. 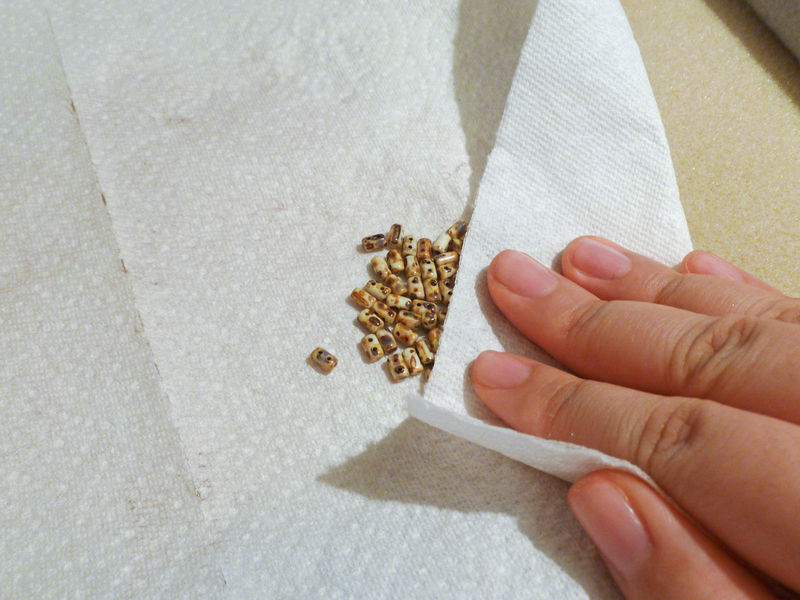 Before you start working with them, put some rullas in a paper towel and pass a cheap thread through their holes to check. 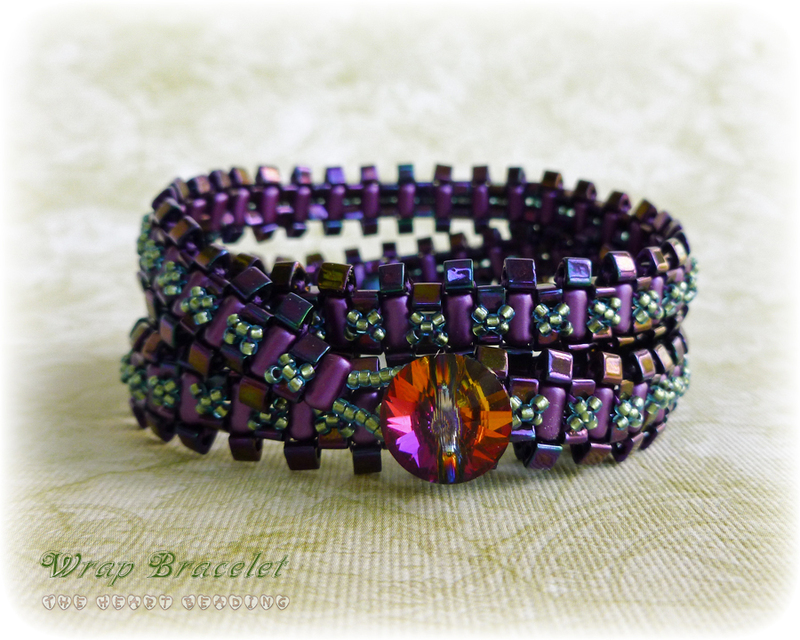 The tutorial I bring to you today is a wrap bracelet. It's very simple and you can make it in one night. In the video I made a bracelet with only two wraps because it would be hard to handle a bracelet with more wraps in front of the camera. 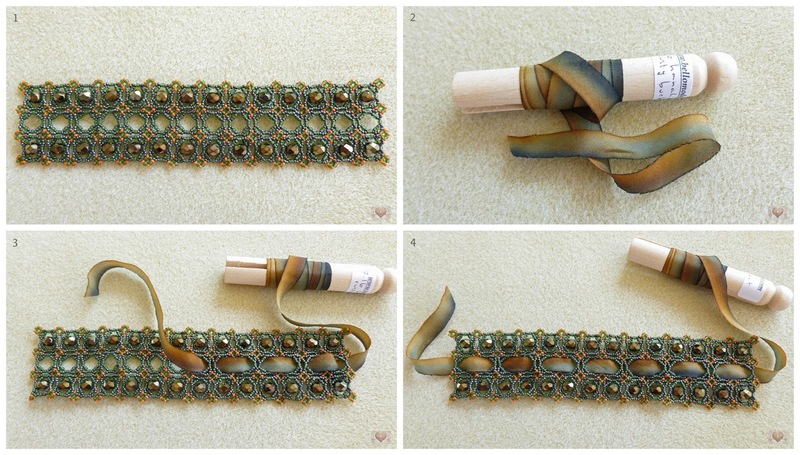 But the idea is that you make a bracelet with how many wraps you wish. 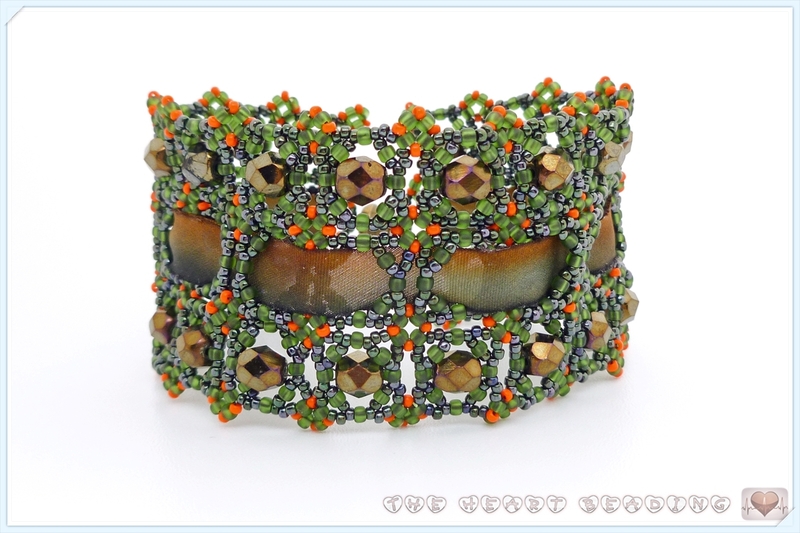 The materials I used are triangle beads size 8/0, rulla beads and seed beads 15/0. 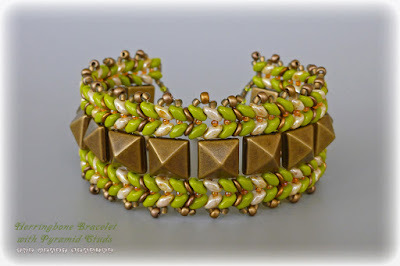 If you aren't familiar with triangle beads or rulla beads, I made a review of them in my last purchase HERE. This project consumes a lot of thread. I recommend you start with a long piece of thread because the first and second steps are fast to do. 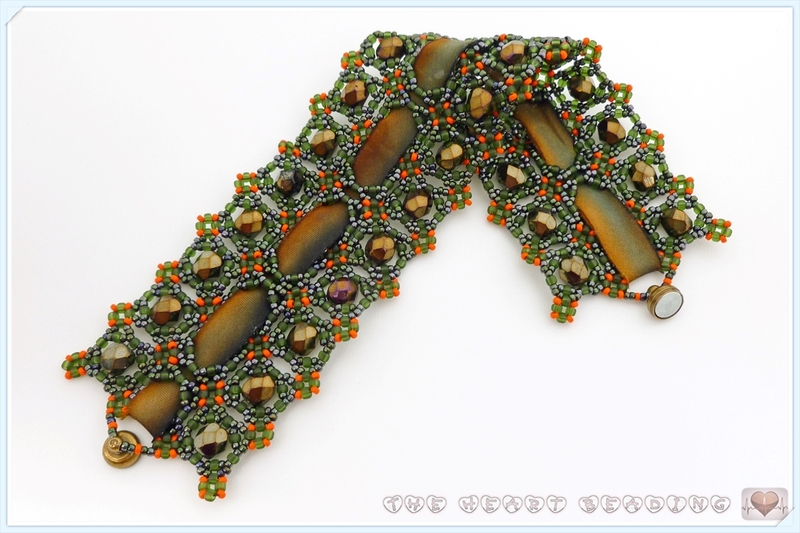 I started my bracelets with 12 ft (3.6 meters) of thread. 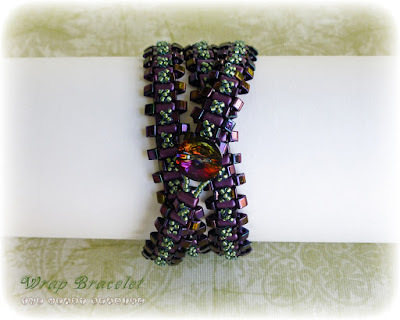 How to know the right length of your bracelet: measure your wrist and multiply the size by the number of wraps you want. Then add 0.5" or 1.3 cm to the result. For example, if your wrist measures 7" and you want a 3-wrap bracelet, the length of the bracelet will be: 7 x 3 + 0.5 = 21.5". 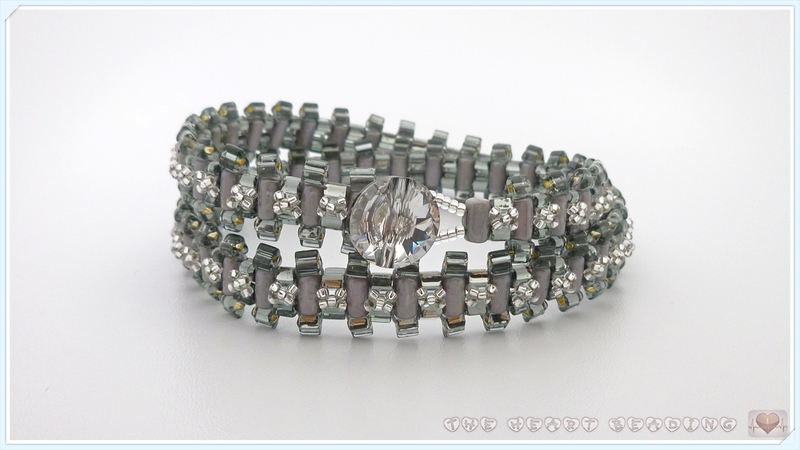 Watch the video tutorial HERE or buy the tutorial in PDF format HERE. 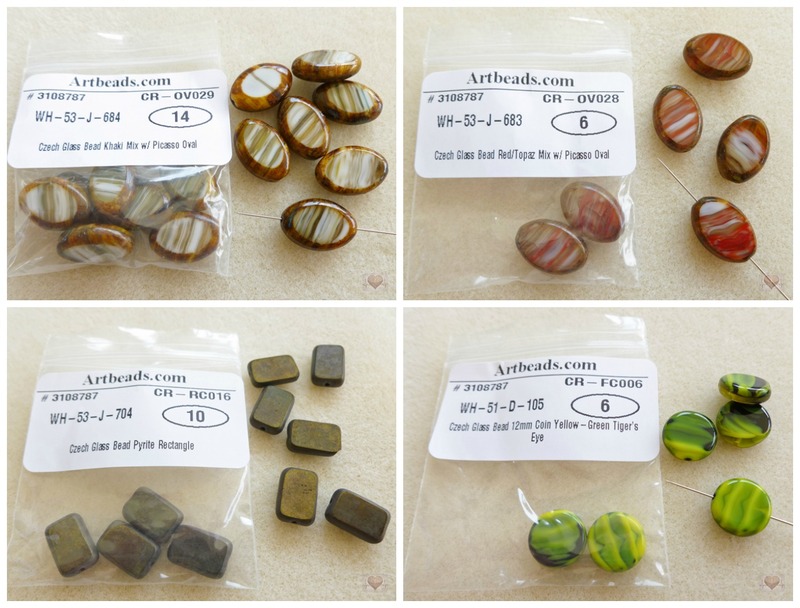 Today I'll make a review of my latest order at Fusion Beads. 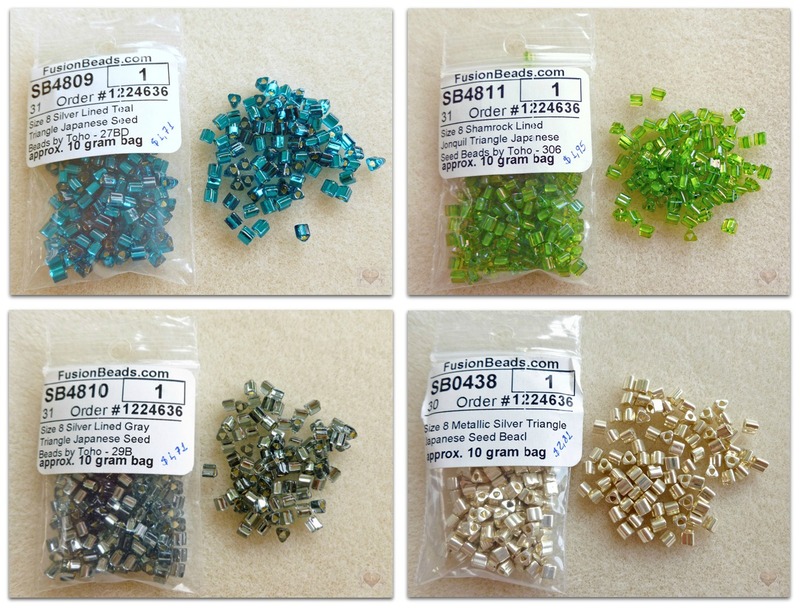 Fusion Beads is an online store that sells materials for making jewelry. What I most like about them is the huge variety of materials they have available. Another good thing is the store is offering deals often, especially at holidays. They also ship for several countries besides US and Canada. Check if they ship to your country HERE. 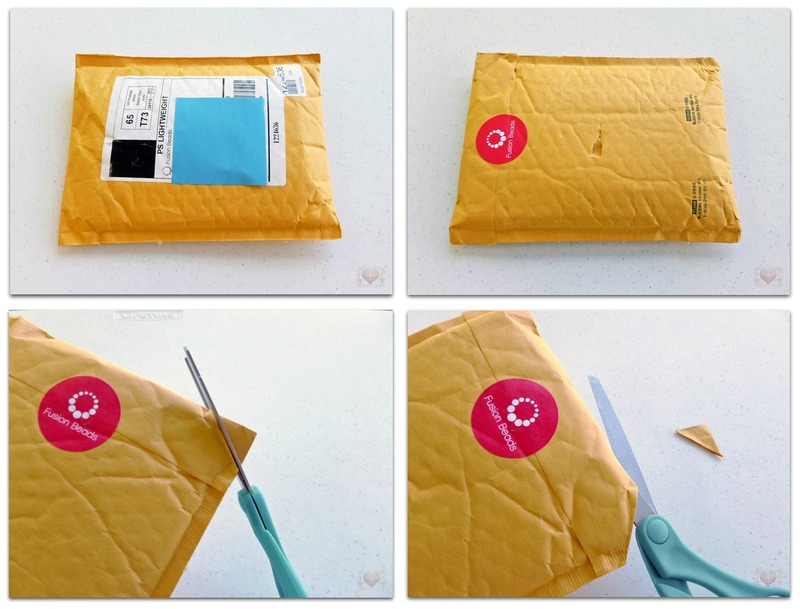 In the last two pictures you can see how I open my packages! Learn from my mistake: this is the best way to open this kind of package. I already cut a bead mat and a couple of invoices because I wasn't very careful when opening a package. 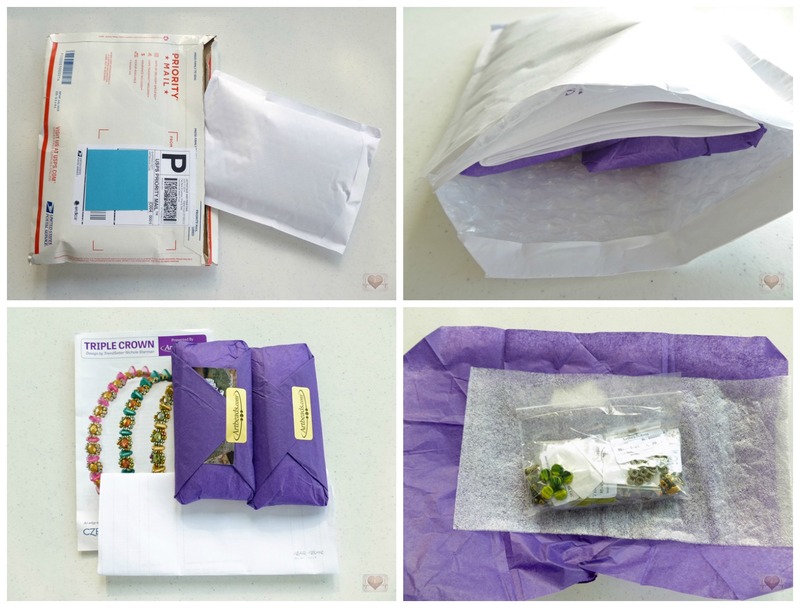 The envelope is internally coated with a bubble plastic layer to protect the products inside of it. 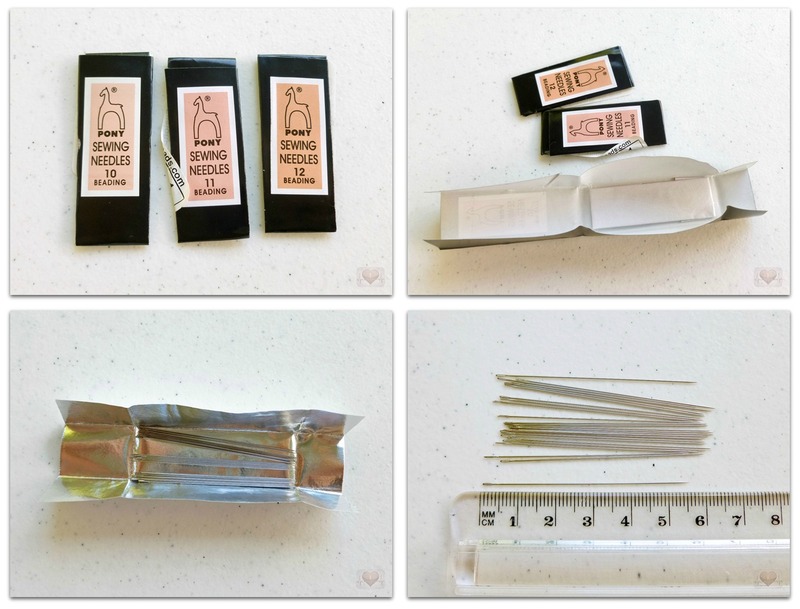 The materials come inside of a zip-lock bag. The order invoice is also included in the pack. 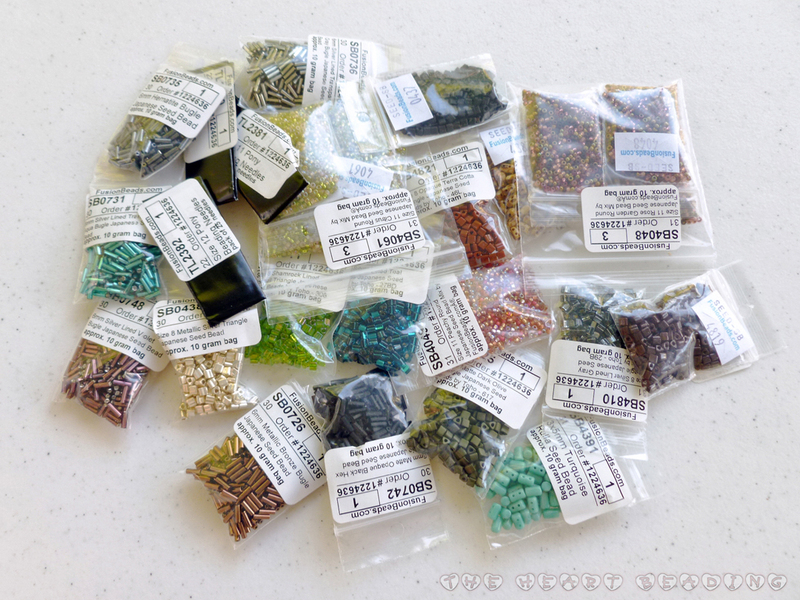 That's my purchase: needles and beads of different shapes! Let's start with the needles because many people asks me which one I use. The answer is: Pony needles. These needles aren't very sturdy. They can bend easily. But this is exactly why I like them: I prefer a needle that can bend easily than one that can break in my hands while I'm working! Moreover you can straighten the needle again with your pliers. They are also less expensive than the other brands. The packs sold by Fusion Beads come with 25 needles. I only bought sizes 10 to 12 because I never needed needles thinner than the number 12. Now let's see the beads! 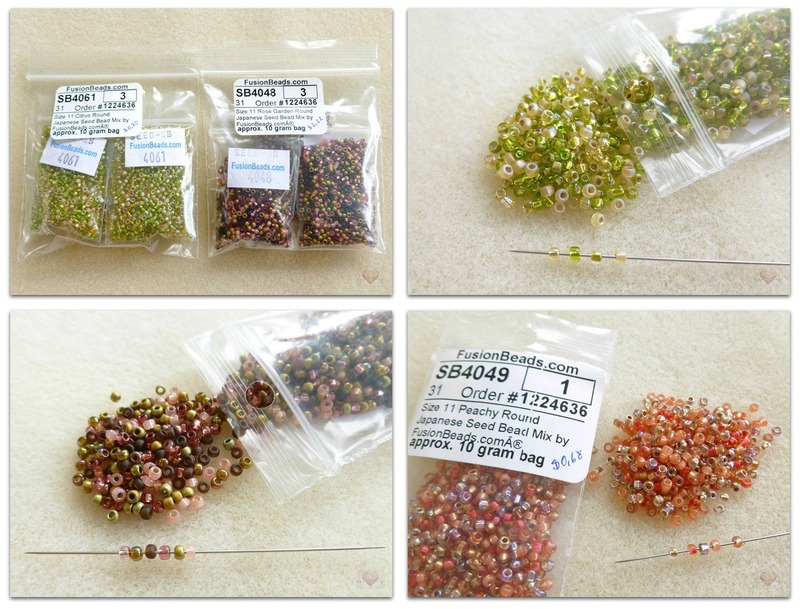 The tree packs you see in the picture above are mixes of Japanese round seed beads size 11/0. 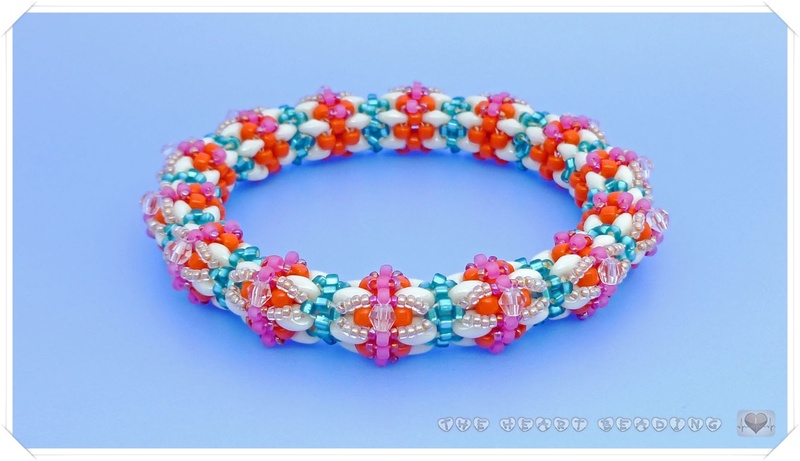 Some stores create their own mixes with different colors of seed beads that combine together. 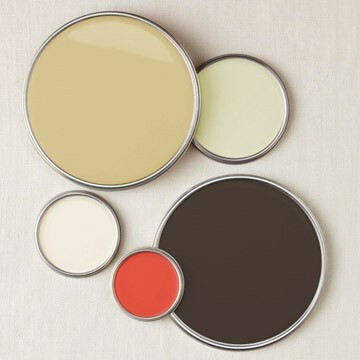 These mixes are good for those who are learning to combine colors. 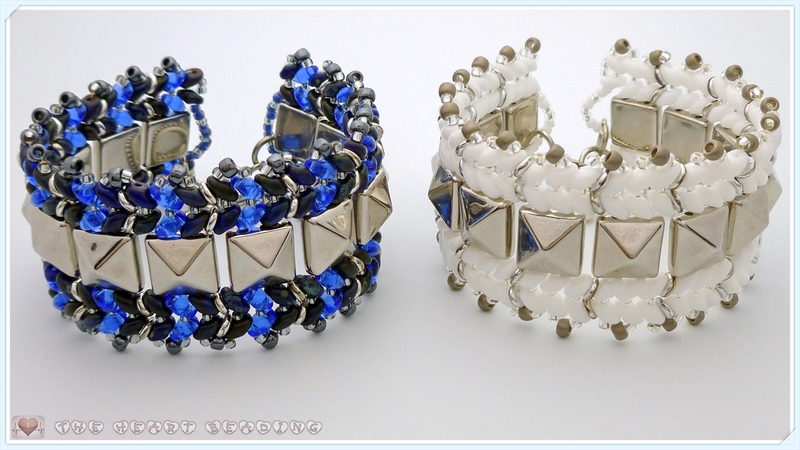 I really like them, especially when they come with beads of different finishes (silver-lined, opaque, luster, matte, etc. 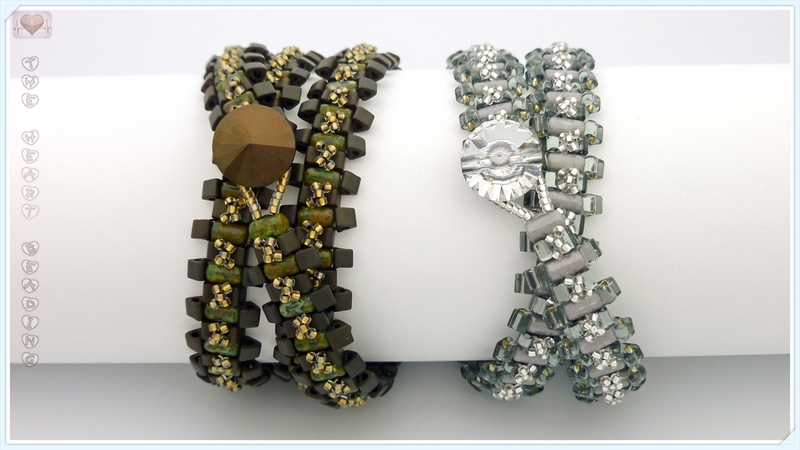 ), like the mixes sold by Fusion Beads. They're great to create a illusion of texture into a design. 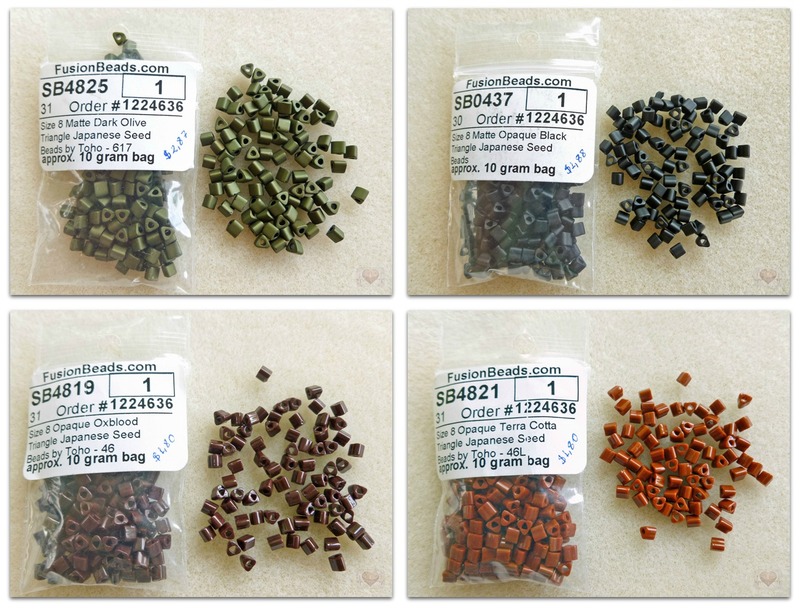 The store sells mixes of seed beads size 15/0, 11/0, 8/0, and 6/0. 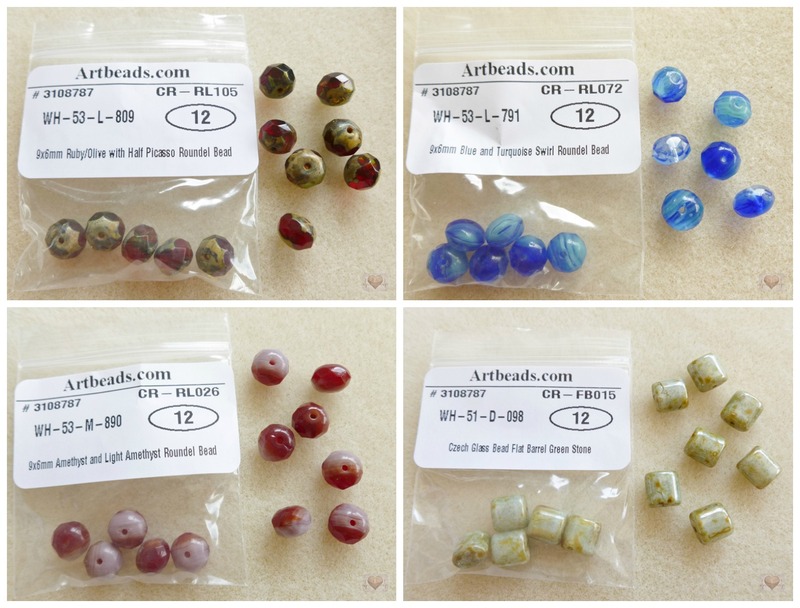 You can also buy beads of the color that you like most in a mix. 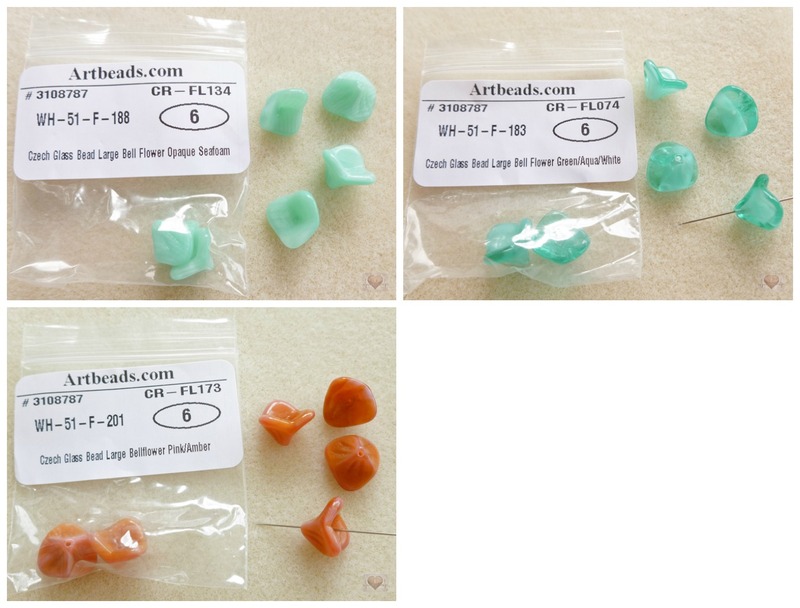 There's a list with the code of all beads included in the mix in the product description at their website. To see all the mixes they have available click HERE. 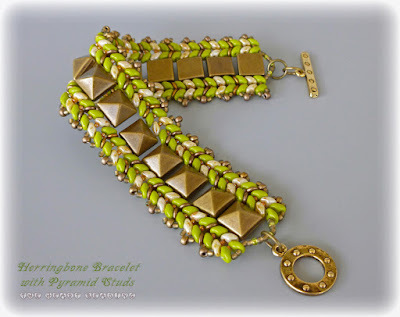 For those who never heard about triangle beads: they are beads with a triangle shape and they're available in different sizes. 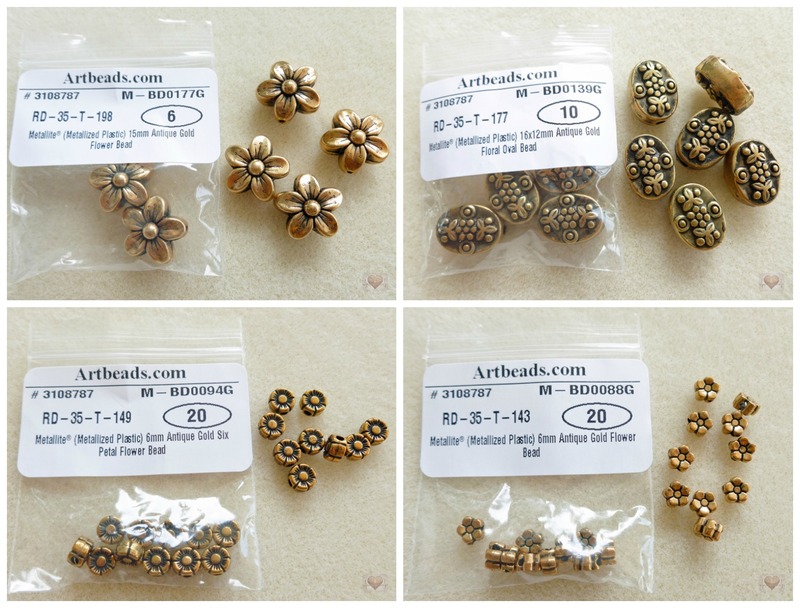 Each size is identified by a number just like the round seed beads: 11/0, 10/0, 8/0, 6/0, 5/0. These beads can be a bit different, depending on the brand. 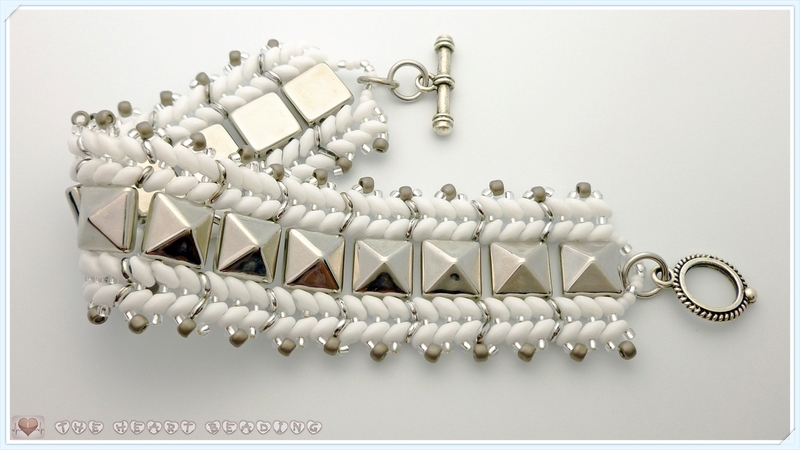 For example, the triangle beads from Toho have sharp edges while the Miyuki triangle beads have a bit rounded edges. 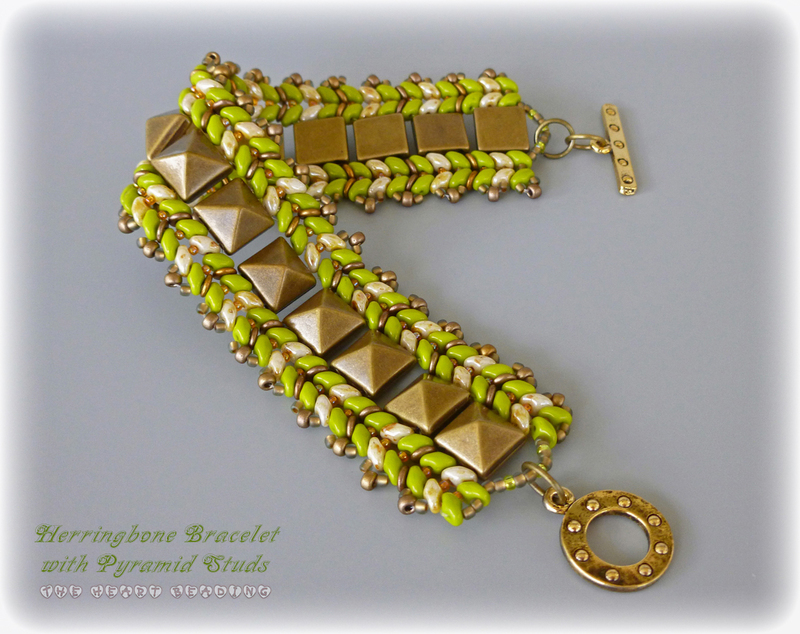 I prefer the triangle beads with sharp edges because fit nicely next to each other. 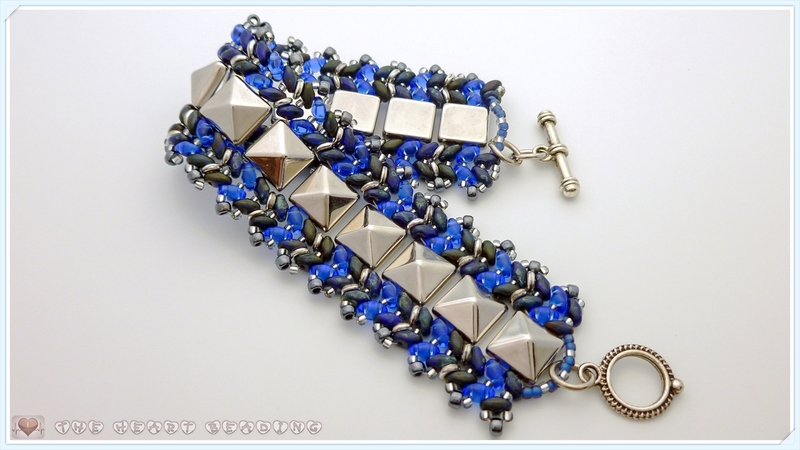 I saw in some online stores that Miyuki recently launched the "sharp triangle beads" - triangle beads with edges more sharp than the regular ones. In the pictures their edges seem even sharper than the ones from Toho. 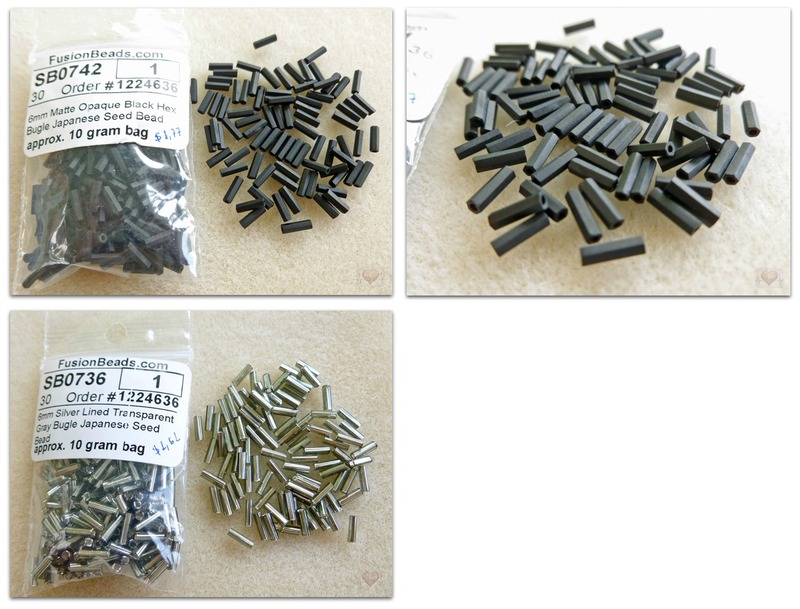 The black bugle beads you see in the picture above are actually hex bugle beads. They have six sides. 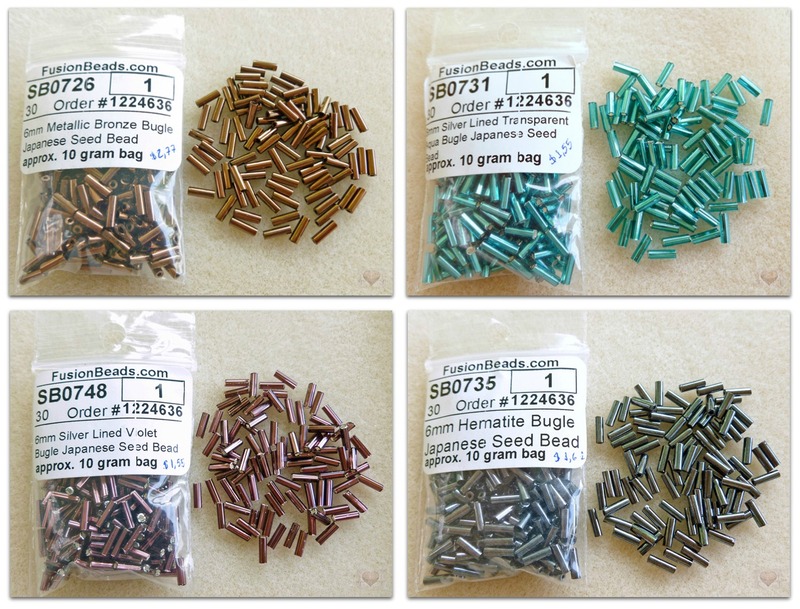 I like them very much, but unfortunately the 6mm hex bugles are available in only a few colors at the store. The last item of my purchase are the rulla beads. 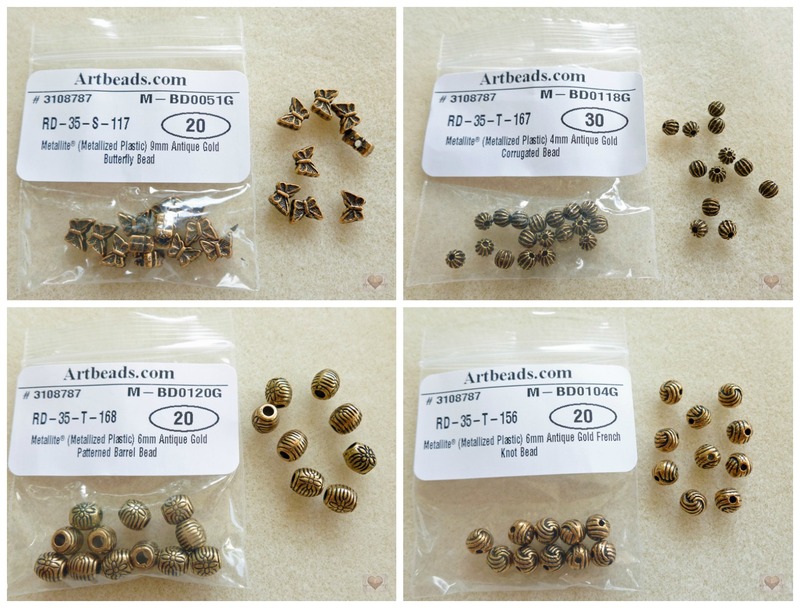 These beads are made in Czech Republic and they have a cylindrical "barrel" shape with two holes on it. They measure 3x5mm. 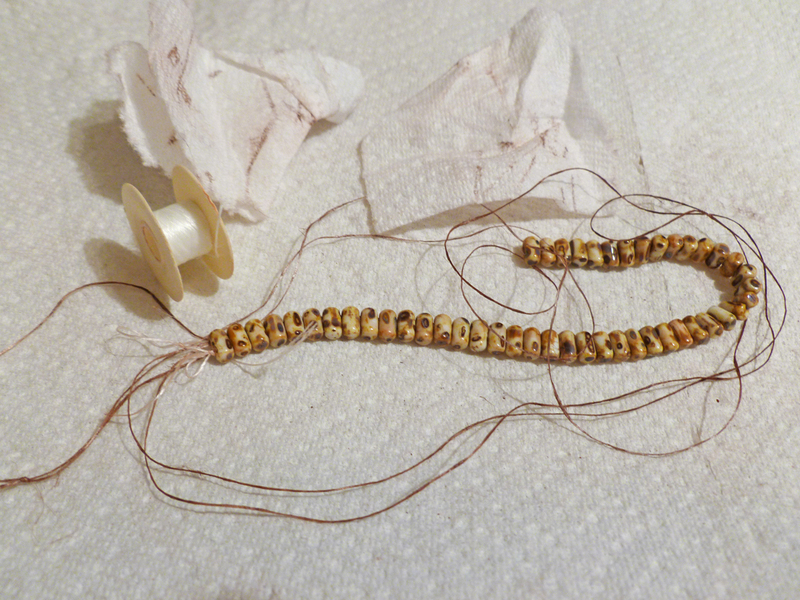 I was playing around with them yesterday and I discovered that the first one - the rulla beads in white picasso color - left my thread and my fingers stained with a brown ink! It also stained my bead mat. The paint went off easily when I washed my hands. But it wasn't that easy to clean my bead mat. The ink comes out from inside of the holes. 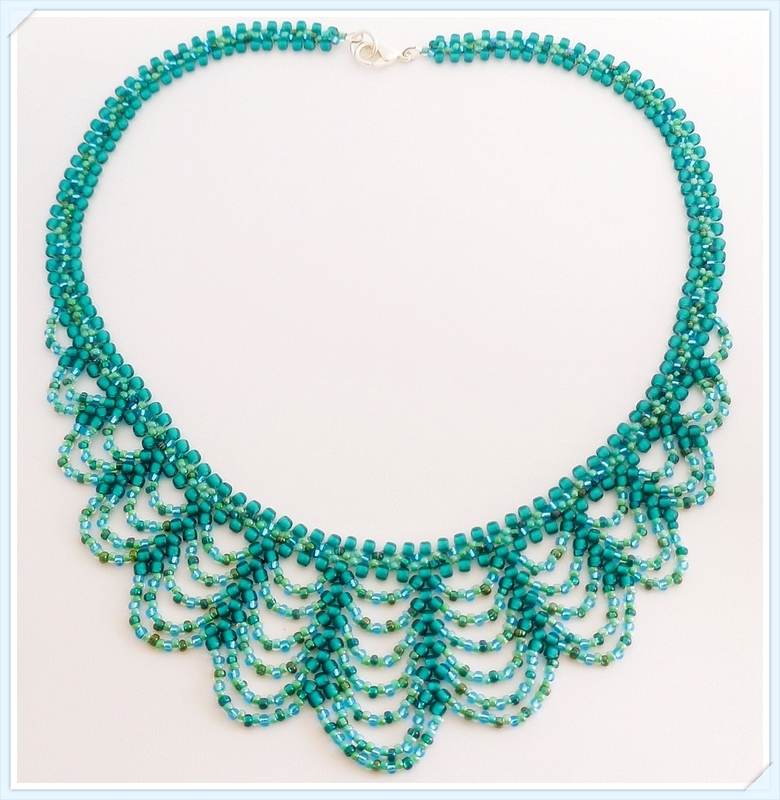 I didn't have any problem with the rulla beads in turquoise color. What makes me think that maybe this is a common problem to the beads in picasso colors. So if you are using the rulla beads in any picasso color, I recommend you put a paper towel on your bead mat before you start working with them.